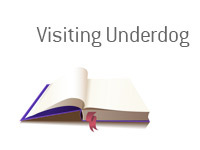 Visiting Underdog Definition - What Does Visiting Underdog Mean? What does the term "visiting underdog" mean in the world of sports betting? What is the definition of the term "visiting underdog"? Let's look at an example - let's say that the Cincinnati Bengals are travelling to play the Denver Broncos on Monday Night Football. According to these odds, the Bengals are the "visiting underdogs", as they will be playing away from home AND be underdogs to win. So, according to these odds, a successful $100 wager on the Bengals would yield a total profit of $340, while a successful $400 wager on the Broncos would return a total profit of $100. As you can see by this odds, the Bengals are the "visiting underdogs".